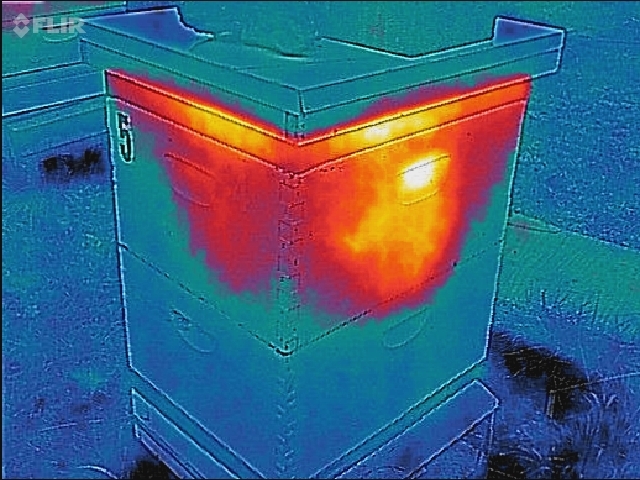 Not once this week but twice, beekeepers have sent me thermal images of their overwintering colonies. 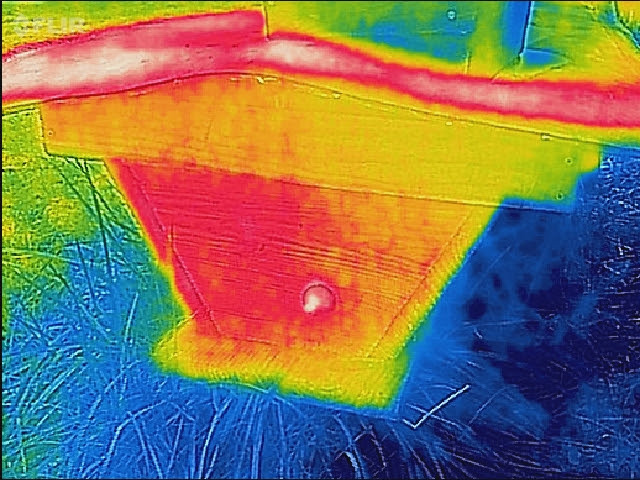 Of course both beekeepers were both men—not once has a woman ever sent me a thermal image. I’m not sure why, but I think it’s because men have more cents than sense! These folks remind me of soon-to-be new fathers who parade around the office with the latest ultrasound of their offspring. “Look! Can you believe how gorgeous!” When I stare at the ghostly black-and-white image of an unborn babe curled up like a three-day-old larva, “gorgeous” is not the word that comes to mind. Interesting for sure, amazing even, but not so much gorgeous. But regardless of all that, these thermal images make me insanely jealous. 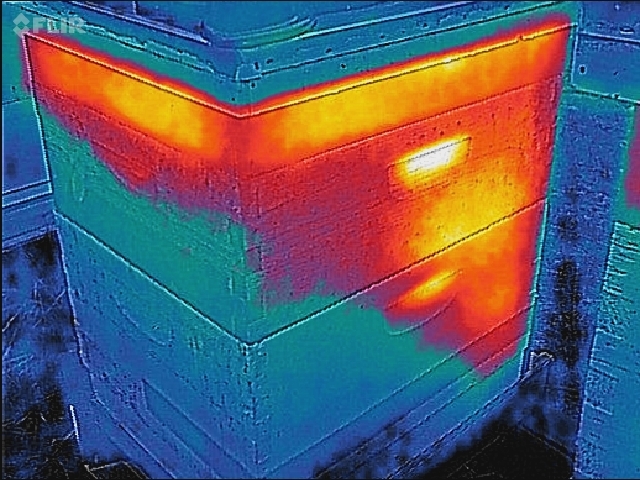 I just love thermal images of anything, but especially bee hives. And these pictures are awesome. They can tell you everything you need to know about your hive, and much more than you can learn by popping the lid and having a look. 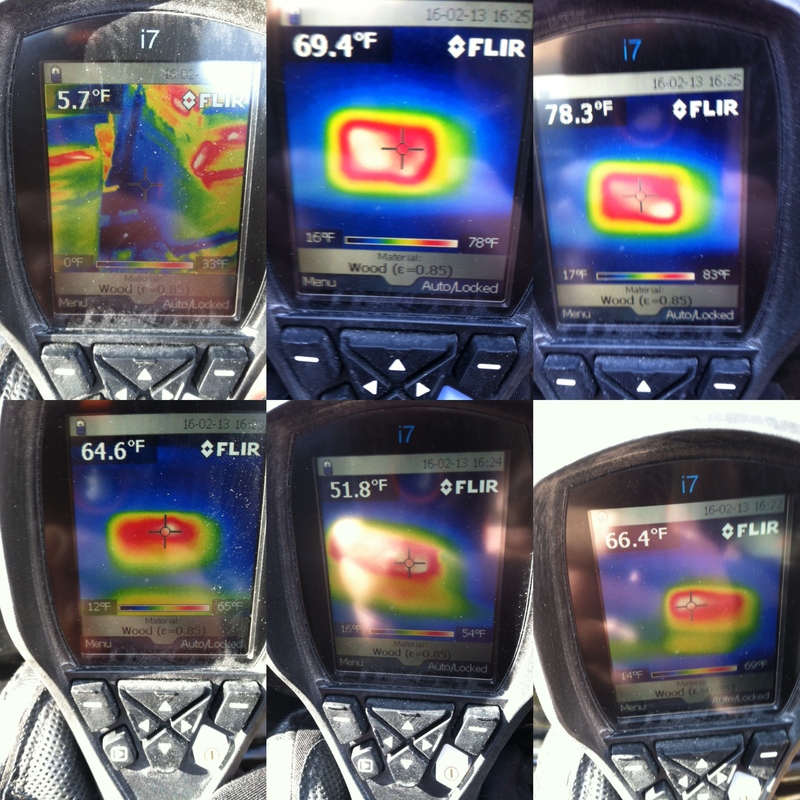 It appears that both beekeepers are using Flir Thermal Imagers, which come in models for both iOS and Android. The first group was taken by Victor Berthelsdorf in McMinniville, Oregon. The photos were originally posted to his website, bnatural-muddyvalley. 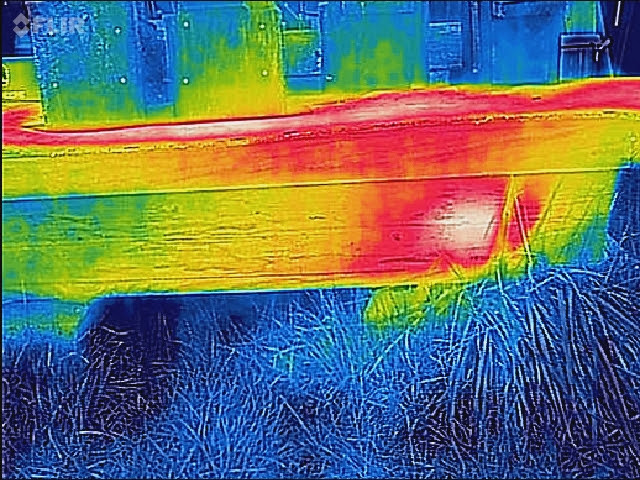 Having just had a serious look at this site, I see it has even more thermal images as well as some awesome native bee shots. I’m very impressed: not only are the native bees in focus, they are identified as well—two things that are difficult to do. The colonies in the photos below look healthy and vibrant—time to get those honey supers ready! Note the temperature graph on the bottom, from coldest to warmest. © Anthony Planakis. 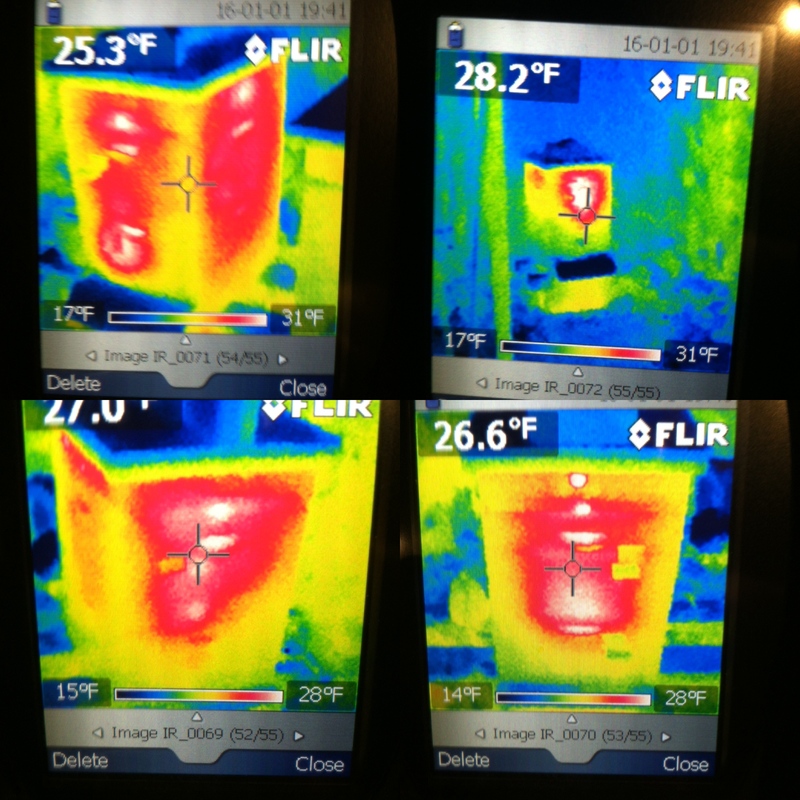 And here are some shots of the hives prior to wrapping, with outdoor temperatures shown on the upper left-hand side. Note the outdoor temperatures in the upper left-hand corner. These photos were taken before the hives were wrapped. © Anthony Planakis. I’m intrigued by all this information. Now I want someone to take a picture of a bottom board (or Varroa drawer) to see if anything is alive down there and crawling around in the debris. Is the Flir sensitive enough to do that? Special thanks to Victor Berthelsdorf and Tony Planakis. *Note: this post contains an affiliate link. FABULOUS! What exact piece of equipment were those first shots taken with?! I would gladly send you pics, but I had no idea about this cool gizmo! I will definitely be getting one!! I’m sure it was the FLIR ONE, but I don’t know if it was for iPhone or Android. They have both. 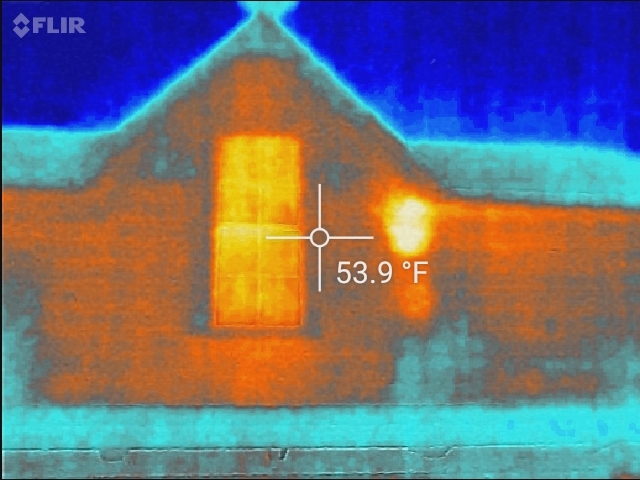 Love seeing the these thermal images. I have a digital probe thermometer to see the average temperature inside. With this device, a good picture of where the bees are inside and how large a cluster is clearly visible. How may I send you a photo? 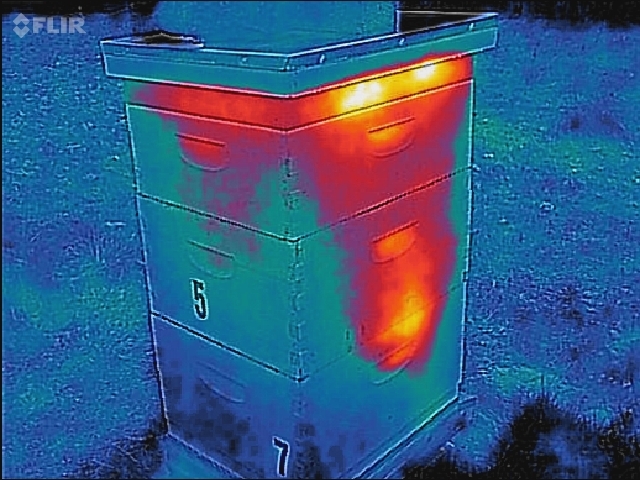 It would be a hive image via Flir One for iPhone 5/5s. I’ve been looking at these lately and now that I see what they can do I’m quite impressed. 1. The image in general is much better than I expected. 2. The IR shows more than I expected, even through Bee Cozy. 3. The distance registers IR farther than expected as seen in 3rd & 4th photo. I may now have to reconsider. Might also be helpful in spotting hen house predators at night in the woods. They were taken with the FLIR One second generation on a Galaxy S-5. They are pretty much sold out, although the i-phone versions are available. 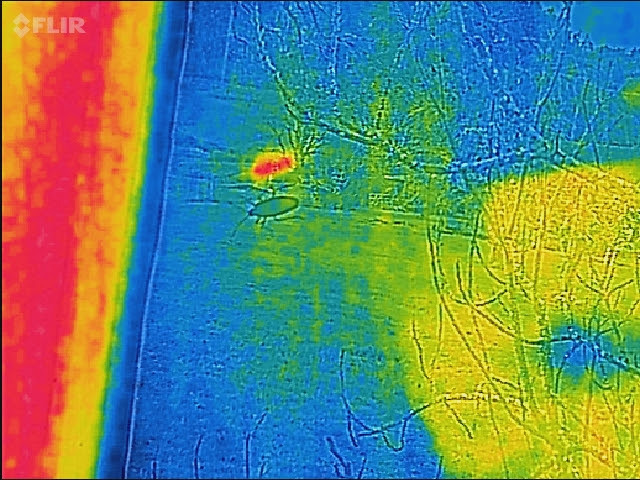 Newer technology, & a fraction of the cost of the dedicated FLIR camera that was used in the composite shots. In all this time, I never connected your name to MuddyValley. Dense, huh? Do you want me to change your name on the photos? Easy to do. PS: The 1st FLAIR One is about the size of a cell phone, self contained, and already outdated technology. The new FLIR ONE now has much higher resolution, is smaller, and more features such as various color pallets to optimize the heat signature on the display & photo. As far as the expense? About the cost of a couple of packages of bees. $250.00. I’m growing my apiary with cut outs, swarms, and this year splits. To me it’s just another tool like the hive vac, and will pay for itself. Cool! My first reaction is, reassured to see almost everyone else’s bees are up in the top of two deeps, as mine seem to be. Except the one at top: what’s that about? Are they moving down, or did they leave a bunch of honey in the lower deep? My second is, tickled that Tony calls his wraps “Bee Cozy” as I do. Great minds. And great pics! Thanks to everyone who braves the elements, not only to see to your bees, but to share this good information. I agree with you, they probably found a stash of honey. 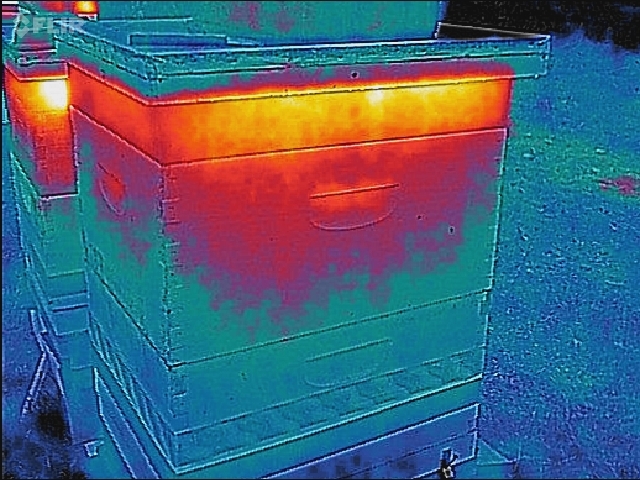 As I sit here in the icy weather wondering what’s going on in the hive, I would love to have thermal images! That’s going on my wish list for sure. Thanks for sharing these. Looks like you will get some thermal images from women now! Below zero just north of NYC …I have used felt paper but no thermal wraps, perhaps you could write more about the pros and cons of wrapping and various options. thank you ! I want a stethoscope now. Have you seen these posts? If not, try To wrap or not to wrap and also How to wrap a hive. While the stethoscope I used to monitor my bees throughout the winter was helpful, it’s not exactly a precision instrument. A thermal imaging camera would have saved one of my colonies this winter. I would have been able to detect the problem sooner and fixed it. So that’s it, I’m sold. I’ve finally decided to buy one. The FLIR ONE doesn’t seem to be available in Canada, but I have until next winter to track something down. 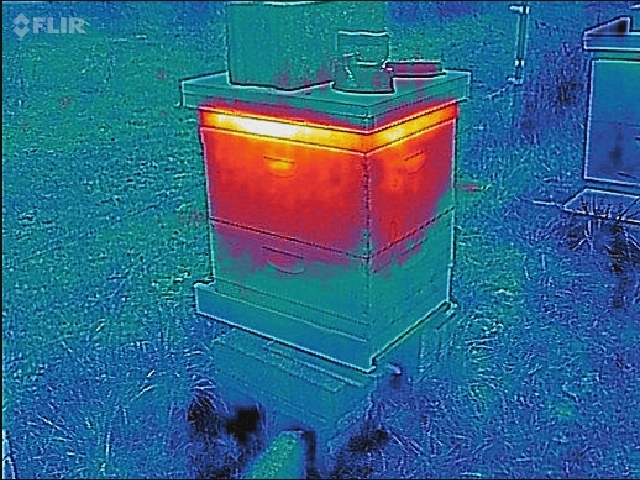 Of all the gadgets for monitoring hives, the thermal imaging seems the most useful to me. Good info! Getting a great education!